I was going on a very inconvenient two day business trip to Delaware. The Company I Am employed by was sending my team to Wilmington for two days of, well, honestly nothing much. I’ll get to the point of the trip later, if I can find it. The thing to recall is that the meeting was scheduled across Tuesday and Wednesday. No the beginning of the week, not the end of the week, stuck right in the middle. 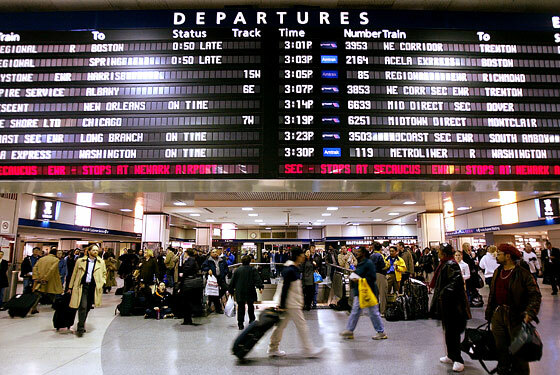 We were all going by Amtrak and were meeting in Penn Station. For me, living in Brooklyn, this was not big deal. My luggage consisted of only what I could carry in my backpack. I made sure to bring a book to read- The Exorcist- and a journal to write in. And it was a good thing I brought the journal because there was a lot to take note of, starting with Penn Station. 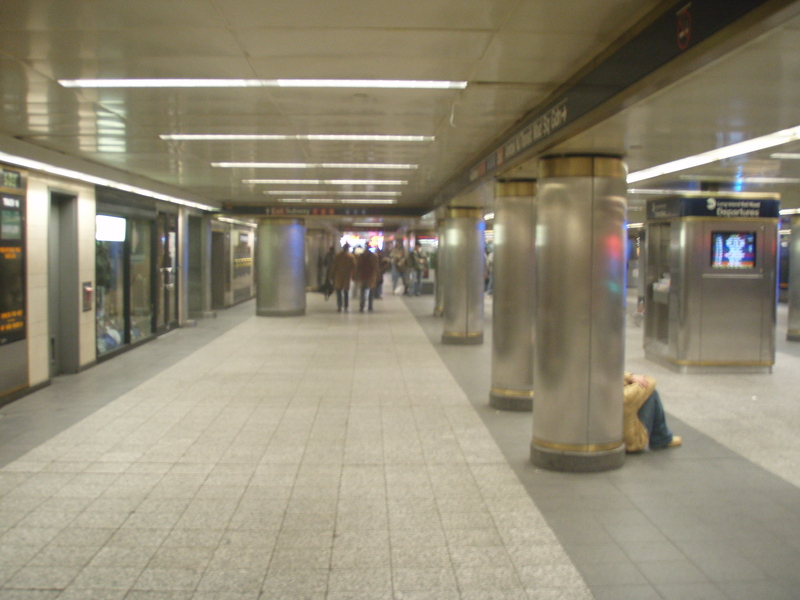 Penn Station is one of the major transportation hubs in the City, located right under Madison Square Garden. (MSG bills itself as The World’s Most Famous Arena and they are right. )This is either a stroke of genius or a stroke of lunacy, placing the busiest railroad center under the busiest sports arena in one of the busiest sections of midtown. I have to think that this was planned for the ease of Al-Qaeda. There, you get a unique mix of businessmen and women, Knicks and Rangers fans, the homeless, tourists, and, I assume and hope, more NYPD surveillance cameras than even Michael Bloomberg can count. 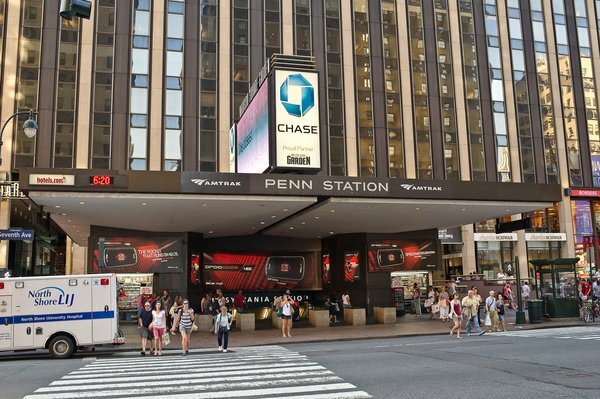 To get to Penn Station you descend a large escalator located right under the Madison Square Arena sign and you better be paying attention because the number one hobby of folks on their way down is drinking coffee and shoving. As you get to the bottom you arrive at a large circular mall. One side is lined with newsstands, seedy coffee shops, and dirty snack bars. The other side is lined with newsstands, seedy coffee shops, and dirty snack bars. Only the companies change. Even the homeless look identical. In the center of the circle, forcing you to go around, is a ticket window. The tracks are on the other side of the circle. This section of Penn Station is currently under renovation and has been my entire adult life. The estimated date of completion is ∞. However, since this New York, we know that the real date of completion will be about 10 years later. I was lucky enough to be there on a holiday, the Annual Clearing of the Hobos. The men’s room entrance was flanked by what appeared to be an honor guard- two rows on either side of the door of uniformed policemen, backed at a discreet distance by heavily armed soldiers (seriously, yes. Penn Station was and still is full of heavily armed soldiers.) Down the center of the parade route were “escorted” an endless stream of filthy homeless sorry, I can’t be politically correct on this, they were too disgusting to be simply homeless. One man was clad only in a garbage bag wrapped around his waist. This was already in full swing when I arrived and went on for another 10 minutes. 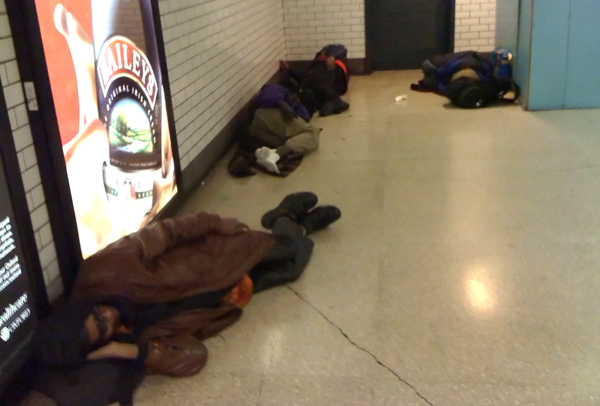 However, the police did nothing to the rest of the homeless loitering around or laying down in the station. I was waiting with most of the other travelers near the arrivals and departures sign waiting for my team. I have to give the Penn Station maintenance staff credit for trying to keep the place clean. Unfortunately it was a losing battle. For example, a business man would drop a newspaper into the garbage can. Problem was, the garbage cans were designed to be very wide to hold a lot of trash but they had very small openings. I saw this happen a few times. The business man would drop his paper into the can, but it would actually either get stuck in the small opening or just sit on the outside of the can. The homeless people each had what seemed like their own designated can. In other words, any trash in or around the can was theirs and when I once saw a homeless woman get too close to another homeless woman’s can the “owner” of the can hissed at her until the interloper moved on. So a newspaper would land on the outside of the can and a homeless person would immediately swoop in from their position just a few feet away and grab the paper. But at the same time, a Penn Station employee would try to get to the can first to stuff the paper deep inside. I feel sorry for those guys because not only is it their job to outrace homeless guys for garbage but they also have to wear little red bowties with their uniforms. New York Magazine called Penn Station the Community Center for the Mole People and I think they got it right. Overall Penn Station was dingy. Superficially it resembles an airport terminal with shops and waiting areas, but airport terminals don’t have a layer of grime or roving packs of trash-stealing homeless. To be fair, the homeless were not a problem for me, in that they did not harass me or anyone else as far as I could see. The huge numbers of police and soldiers might have had something to do with that. Al this time I was waiting for the other three members of my team to arrive, including my direct supervisor. I met up with her first. She then confirmed that the third member of the team was in the station, somewhere on line behind us. We were not able to confirm if the fourth person was even in the building when our train was called and we went to the tracks. ← Allan Keyes Presents: Idiocy Both Accidental and Purposeful. My first reaction is that the trip can only get better. But somehow I don’t think that’s going to happen. The train trip was excellent, which will be the subject of the next part, and the hotel room was simply amazing. But the devil is in the details. Hmm, just why was such an awesome hotel so cheap…?